I was having a lazy Saturday afternoon when my little sister called in a panic. She was stranded roadside with a flat tire. After a few minutes of panicked rambling, I finally gleaned that not only was she stranded on the shoulder of a busy interstate with a busted tire, but there were not one, not two, but three men pulled over attempting to assist her. After reassuring her they were just trying to assist the perceived damsel in distress (and she was indeed in distress, because she had no idea what to do), I assured her she was overly concerned about the intent of these strangers. Or was she? As I drove out to help her, I began to wonder if I should be more worried. It was the middle of the day, a bright hot August afternoon, and she was out in broad daylight with plenty of passersby to be potential witnesses should anything go awry. But what if this had been in the middle of the night? Or on a lonely country road? My little sister could have become a prime target for any possible predators roaming the byways. It made me realize too many young women, like my little sister, have no idea how to handle themselves when their car breaks down (You can thank a society which tells them fixing cars is for boys, not girls, for that one). Not being prepared can lead to unnecessary stress and fear, which puts up a toxic roadblock to logical thinking when you find yourself in a dangerous situation. As I drove down the road, I realized there were a few things everyone should know when they drive a car. Learn how to change a flat tire. The mechanics are relatively simple; the steps are easy. Make sure you always have a tire iron, a donut (a small spare tire designed to get you to the nearest tire shop) and carjack in your trunk. Nearly every car comes with a donut and a tire jack these days. –Secure the jack on level ground, in a place where it can attach to the car frame. 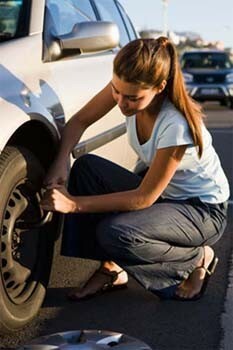 –Use the tire iron as a handle to turn the crank of the jack, causing it and (eventually) the car to rise. –Use the wrench end of the iron to twist the lug nuts off the tire (Sometimes you may have to remove a hubcap first, but those are usually easy to pop off, hence why they get lost so often and are seen hanging out roadside). –Once the lug nuts are removed, pull the flat off and place the donut on. –Then reverse your previous steps. Not too bad, right? Most people really are inherently good. If they stop to help, that’s probably all that’s going to happen. That doesn’t mean you shouldn’t stay vigilant and aware of your circumstances. Don’t leave your keys or phone in the car; put them in your pocket. People often leave these important items laying on the passenger seat, making them unavailable to you if you need them, but free for anyone around. And be sure to lock the car doors. Ultimately, trust your instincts. If you don’t feel comfortable with the person attempting to help you. You can politely refuse their help, saying you have someone on the way. It also couldn’t hurt to carry pepper spray or take self-defense classes. Easy precautions like these will not only make you feel safer, but actually make you safer because you have the confidence to deal with the situation. Have someone on the way. AAA in an inexpensive and reliable means to get the help you need and stay safe. Sometimes, even when you’re an expert at changing tires, those darn lug nuts just won’t budge. Or maybe you ran out of gas. Or maybe there’s no one around to jump that dead battery. AAA will always come when called, even if it takes a little while. Calling AAA, a friend or family member means someone knows where you are or where you should be. Most importantly…remain calm. There’s something to be said for all those posters and sayings. That meeting, that date, that party…whatever it was you were on your way to…isn’t as important as your personal safety. Flat tires happen. Sad, but true. By the time I arrived at the scene with my sister, her tire had been changed and two of the three men had gone on their merry way. The last, the kind gentlemen who actually changed her tire, remained with her until I arrived. I took her out to dinner, and while we talked about what happened, she said her reaction probably came from paranoia. But moving forward, I know she is ready to handle similar situations because I took that time to share what I’ve learned with her. It’s better to know and be prepared.